A SURVEILLANCE HELICOPTER FLIES OVER BAGHDAD. PHOTO BY RLD73 VIA FLICKR. Dunya Mikhail left with a single suitcase and a vow to herself. “I left with this condition, like Orpheus, to not look back, because I didn’t want to lose my Eurydice,” she said. “But we can’t not look back,” and it’s became harder for Mikhail to keep her thoughts from the violence and destruction in her beloved Iraq. And so she returned from her first trip back to Iraq in 20 years. Mikhail returned to her home country to understand the lives of women who were held captive by the militant group that refers to itself as the Islamic State, or ISIS. Many of them were Yazidi. According to a United Nations' investigation that was made public in June, followers of the ancient faith are victims of genocide at the hands of ISIS. Mikhail had already become familiar with many of their stories. She’s learned of the horror they faced through a man known simply as Abdalla. “In the beginning her story was kind of like Romeo and Juliet where she married somebody from outside of her religion and her family abandoned her and his family abandoned him.” Alone aside from her two young children, Mikhail said, the woman went searching for her husband in Mosul only to find that he had been killed. The small family was taken captive by ISIS, and although she was guided to safety by a militant who had been her neighbor, it wasn’t before her son was killed. Although she’s completed her manuscript, Mikhail said she’s troubled by the trauma that continues to plague the women she so closely connected with who’s stories she featured within it. Her book about those women will be out in Arabic next month. It awaits an English translation. Mikahail was in Washington, DC in March for the literary and art festival Al Mutanabbi Street Starts Here when I spoke with her over tea. We talked again again over the phone in August. The questions below are an abbreviated form of our conversation, which has been edited for clarity. 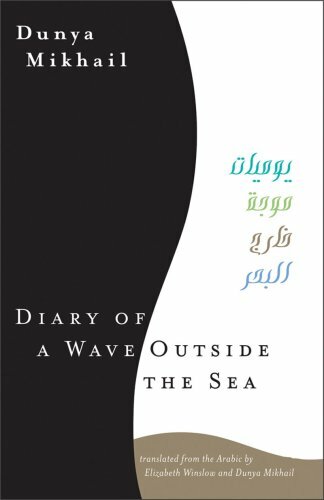 Excerpts from her poem, "Diary of a Wave Outside the Sea" are interspersed in the interview. HOW DID YOU MEET THE WOMEN WHO HAD BEEN HELD CAPTIVE BY ISIS? I met [Abdalla], met his family, we drank coffee together in his house. He took me to the camp and I met people people -- women and families. I took pictures. [...] I thought that I would ask them more questions, but I didn’t feel like asking them more questions. I didn’t feel like [I could ask them to] open their wounds. I found myself just asking them casual questions, like ‘How are you? How are you doing?’ But I met other people that I [hadn’t already heard about from Abdalla] who had new stories. [...] With these stories, how can you not be haunted day and night? I can’t forget about these women. All of these stories are unbelievable. THE LALISH TEMPLE IS THE MOST REVERED SITE AMONG THE YAZIDI PEOPLE, WHO NUMBER AROUND ONE MILLION. PHOTO BY ILYA VARLAMOV VIA WIKIMEDIA COMMONS. WHAT DOES IT MEAN TO LOSE HOUSES OF CIVILIZATION IN YOUR HOMELAND? DO YOU FEEL COMPELLED TO WRITE ABOUT THE DESTRUCTION? It first started with seeing a video, and I couldn’t believe they were destroying these monuments and our statues which date back to thousands of years ago. I saw a video [of art preservationists] reconstructing the statue of Adam from 500 pieces, and he stood back up. They repaired Adam’s statue, so I thought maybe we can repair this, when I watched the video [of ISIS]. But then one terrorist, he brought a hammer, and he was destroying it into smaller and smaller pieces. That’s how my hope began breaking into smaller and smaller pieces. I was really moved so deeply by this so I called relatives and friends in the north [of Iraq] and they were telling me about what’s happening -- the people that are kidnapped and killed, women who are enslaved -- and that some escaped. By chance, I got to know their stories through some connections and they’re amazing stories. Some, we don’t know their stories because they are in the mass graveyards, but all of this material, it’s unbelievable. It’s something, I think, that’s never happened in history. As artists, we respond to this. And maybe that’s why this new manuscript is not like any of my other books; because what’s happening is unbelievable so [the work mirrors that]. DO YOU HOPE THAT THERE WILL BE A SOCIAL OR POLITICAL OUTCOME FOR YOUR WORK OR IS IT PURELY A WORK OF POETRY? DO YOU THINK YOUR BACKGROUND IN JOURNALISM OFFERS A CONNECTION TO REALITY, A GROUNDING, THAT POETRY IS OFTEN CRITICIZED FOR LACKING? Many stories, I do use them and turn them into poetry but the question is how you turn it into poetry. It’s not on the ground and it’s not on the high tower. As far as I’m concerned, I use the material, realistic material, and I work on it as an experience. It’s not only about an experience, poetry is itself an experience. That’s where the important part comes for me: when you work on a poem and how you deal with it as a work of art. This the important part. WHAT HAS CHANGED FOR WRITERS IN IRAQ SINCE YOU LEFT? IRAQI CONTRACTORS PREPARE TO REMOVE A STATUE OF SADDAM HUSSEIN'S HEAD FROM THE PRESIDENTIAL PALACE IN BAGHDAD, IRAQ ON DEC. 2, 2003. PHOTO BY PHOTO BY TECH. SGT. JOHN HOUGHTON VIA WIKIMEDIA COMMONS. When I was there [during rule of Saddam Hussein], all of the newspapers and magazines, everything was governmental. There was no private sector at all. Ironically, there was a saying on the corner of every newspaper that said, ‘Write freely whether the government likes it or not.’ And everyone knew that was a trap. Not even a joke, but a trap, [for anyone who might] believe it and write write whatever they want. We were seeing a lot of journalists disappearing, suddenly. We knew what was going on. [There was] a red line. We knew what we shouldn’t do if we wanted to stay alive. These days, there’s no more red line. It’s not that everything is government. We had three newspaper, maybe four [under Saddam Hussein] now there are hundreds and hundreds of newspapers. They’re allowed. Censorship is not like [it was] before when there was a Department of Censorship. there was a question mark by my name -- for disloyalty. He was loyal to them, but not loyal enough. HOW DO YOU FEEL ABOUT AMERICANS REFUSING REFUGEES GIVEN YOUR EXPERIENCES AND WHAT YOU WENT THROUGH BEFORE YOU COULD FIND SENSE OF HOME? Even though I understand their point, that some bad people might be among the good people... I don’t think so. To deny access to all these people because of the possibility that maybe someone is not a real refugee but just went through [the process to gain refugee status] for a different reason. That doesn’t justify ruining the whole experiences and having a big label of, ‘No to immigrants.’ [...] Most of these refugees, they appreciate [everything]. It’s easy to appreciate everything, every opportunity [when you’ve lost so much]. [...] I feel lucky. Even though I left with one suitcase, nowadays people are leaving with nothing. Not even one suitcase. They’re leaving with nothing and all they want is safety for their kids, for their family and you deny them that? How can we claim our humanity if we can do that? A lot of things we delayed [for me] my marriage was delayed, my education was delayed, but that’s a long story. I tell it in the Diary of a Wave Outside the Sea. And these things would have been delayed forever if I didn’t take steps to [leave Iraq]. I would not have my daughter then. [...] We should be like birds. Why not? Just travel freely in the world. I am sorry I left you among the ruins. I am sorry I left without saying good-bye. I apologize to my new home, for carrying the ruins with me. I apologize or not being able to be in two places at once. by turning my face to the wall. and the rhythm of water fountains. instead of running to escape explosions. Life continues behind their backs. credit cards, and fast food. YOU’VE LIVED THROUGH WAR, BUT THE MAYHEM ONLY SEEMS TO BE GETTING WORSE IN IRAQ. HOW HAS WAR CONTINUED TO RICOCHET THROUGH YOUR LIFE? I opened my eyes to the war and then it was growing [up] with us. War was in our everyday lives. In classrooms, the windows were shaking and the teacher was going on with her lesson because it became normal; everyday that was happening. You would walk and then a missile would fall there right by the university. It was living with us, the war. We even had a room for the war. It was called ‘War Room’ that we designed for the war with tape on the window, and all of that, as if it was living with us and we had space for it in the house. When the siren went off, we went to that room, all of us, until it finished. [...] Usually the light turned off [on their own] but the rule was that if it didn’t we should turn it off ourselves. That’s why I have a poem that says, "The war is a button to turn off the light" because it’s associated [for me]. Our everyday life was so surrealist. War was living in these details, in everything. [...] The war was in every detail, in everyday life. We grew older, and the war is growing old with us. I don’t know if it will die with us or if it will survive after us. My dreams were like the yolk of a boiled egg. or how or when or why. I could fall in a well and be forgotten. away from the glittering dreams of the public. Newer PostIS 'THE HANDMAID'S TALE' A PROPHESY FOR AMERICA'S FUTURE?